So wait are you telling me that there are different types of fertilizers. There are slow release fertilizers and now you add water-soluble fertilizer to the mix. You have to understand that feeding your plants is just like feeding yourself. Think of it this way in terms of nutrition & health. Part 1 of this series can be found here. You can either take a mega load of vitamins & minerals, eat raw foods with the same vitamins & minerals or you can get an IV solution intravenously. All of these ways will ultimately get you the nutrients that your body needs. Your body will process & absorb the IV solution much faster since it is in a liquid form & already broken down. Of course, there’s more to it, but you get the idea of how simple the differences are. In terms of fertilizers, just think of fertilizers as how quickly your plant can absorb their food. It is important to know this distinction as a gardener. Deliver the right food at the right time. Water soluble fertilizers are basically any type of fertilizer that mixes with water. It is a liquid form of NPK fertilizers that is readily available for your plant. These fertilizers can be applied by watering the base of your plants and is absorbed through the roots of the plant. The fertilizers can also be applied by watering the leaves and absorbed as a foliar feed as well. Basically, there are many different types, but let’s break down the 2 main groups of water-soluble fertilizers: Organic & Inorganic Fertilizers. A water-soluble fertilizer that falls into this category will be liquid organic fertilizers such as fish fertilizer, seaweed (kelp) fertilizer, compost tea or some combination of other naturally occurring organic matters. The organic fertilizer products should have a label on them that highlight how much NPK fertilizer they contain. 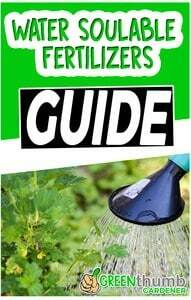 This is true for either organic fertilizers or inorganic fertilizers, so go back to the basics when you need to select how much NPK fertilizer you need for each plant. Organic fertilizers supply the plants with naturally occurring nutrients. There is an old adage that says you are what you eat. A safe way to build your soil. There are tiny microbes in your soil that are part of your garden. It is vital that you have as many of these microbes available. Generally speaking, most organic fertilizers are safe for these microbes and they tend to thrive in environments with organic materials. You plant roots will not burn from applying too much. This does not mean go out and dump a whole bottle of fish fertilizer on your tomatoes to get bigger. It is just a distinction between some inorganic fertilizers. Organic fertilizers are biodegradable, sustainable, replenishable, and safe for the environment. The nutrients may not break down as fast as soon as you need them. There is a slight advantage of chemical fertilizers that it is absorbed much faster by the plants. Most gardeners would not notice the difference but experiment with your plants if you want to see the differences for yourself. Its all part of being a gardener to get out there and get dirty & not just take my word. Nutrient ratios are often skewed for commercially available products. It is safe to assume that you will get the correct ratios in these products, but it is often higher in certain nutrients since organic matters have a range of nutrition. Really this is an advantage, but still, want to give you the full picture. Organic fertilizers tend to be more costly than inorganic fertilizers. Inorganic Fertilizer – Are they really as evil as most think? Water soluble fertilizers that fall into this category would be flagstaff products from Miracle-Gro or Scotts brands. Both have inorganic too, so not knocking either of them. The biggest distinction is in how it is made and what it is made from. They are derived from synthetic compounds such as ammonium phosphate. Usually, the sources of some the compounds are found in rocks & petroleum products. MMMkay..so is this really bad for my plants? The answer is yes and no (sorry to bust everyone who is all organic). There are some benefits to using them, but it is a short list. The NPK ratios are exact. They have sliced and diced these chemicals to be spot on. They cost much less than organic fertilizers. Long term usage of them can change the pH of your soil. This is not good for your beneficial microbes in your soil. The goal of any gardener is to build your soil over time. 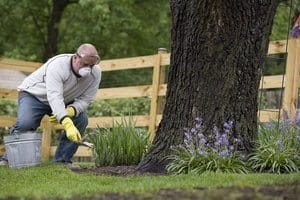 Chemical fertilizers do nothing to help improve your soil structure and potentially damage it in the long term as the chemicals can build over extended time. 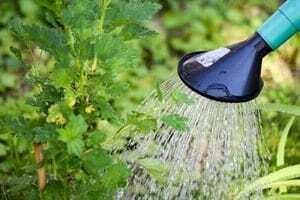 What is the best liquid fertilizer? Ok, at this point you now know that water-soluble fertilizers will help me grown squash like a boss. You know the differences between organic and inorganic fertilizers. Remember, that water-soluble fertilizers are best for plants that need the nutrients much faster. So maybe this may be good for your container plants, or when you just plant your seedlings, or maybe for your supplemental feedings throughout the season. So what do you do next when deciding. Go back to the basics and figure out what ratio of NPK you need for each plant. Write that down. Choose between the actual liquid form or the powder that your mix with water. There you have it! 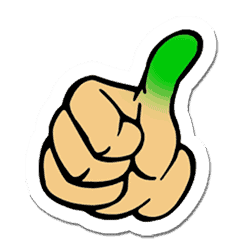 You know have a better understanding of what a water-soluble fertilizer is. Now get out there and get dirty.